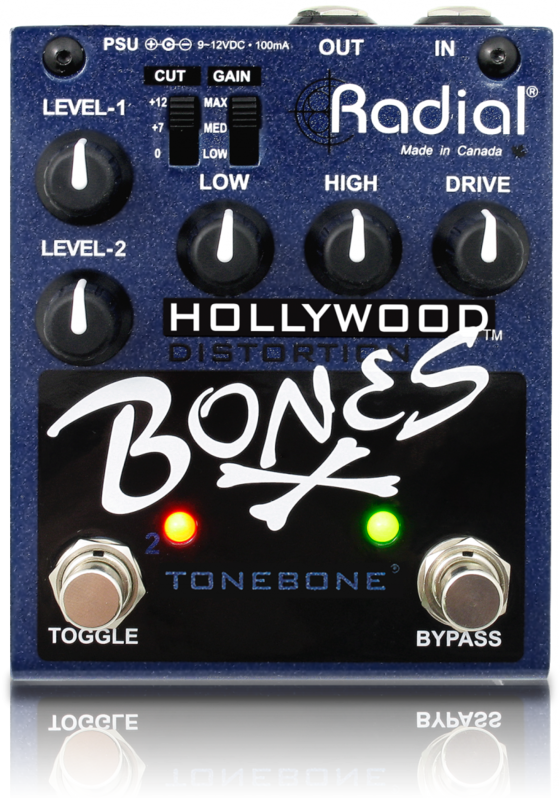 The Hollywood is a solid-state version of the popular Tonebone Classic distortion pedal. The ‘magic’ inside is a dual-stage drive circuit that produces sweet yet distinctive tones reminiscent of the best sounding American tube amps of all times. And like the Classic, the Hollywood delivers the feel and dynamics of a real tube amp. This means that when you play softly or turn your guitar down, the Hollywood will clean up nicely yet allow your playing style to shine through. Creating the sonic range begins with a 3-position gain switch that lets you transition from bluesy overdrive to over-the-top distortion. 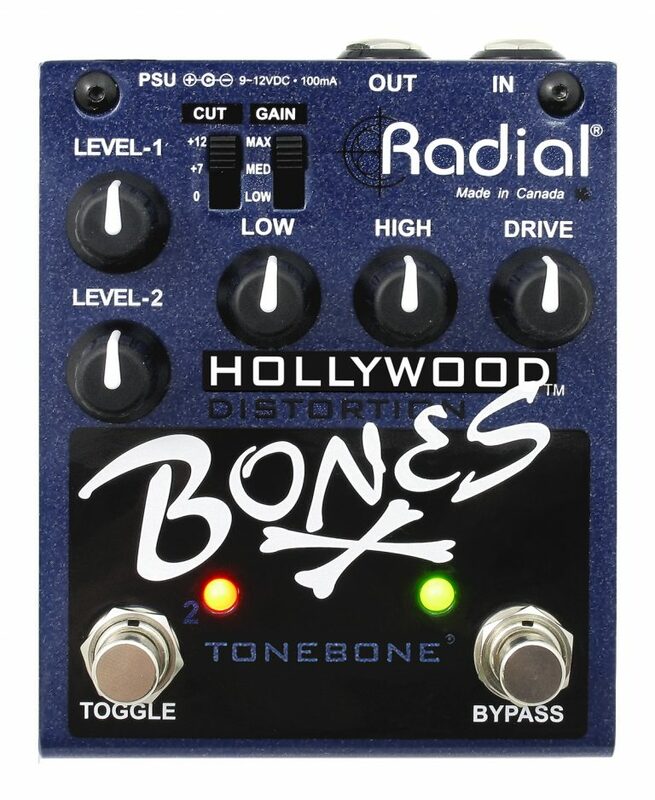 This works in conjunction with a drive control that lets you dial-in the perfect amount of distortion. A powerful dual-band equalizer with Radial’s distinctive passive-interactive tone circuit lets you carve the tone to warm up the bottom end or add extra shimmer at the top of the spectrum. A 3-position mid boost helps solos cut through the mix and accentuates sustain for soloing. It’s also great for fattening up single coil pickups without compromising the distinctiveness that has made these types of pickups favorites with so many unique sounding artists. For maximum on-stage efficiency, the Hollywood is configured for ‘clean, rhythm & lead’ playability, whereby in bypass mode, you get the natural clean sound of your guitar. When the Hollywood is activated, you can seamlessly toggle between two drive gain settings for rhythm and lead. To increase sustain and cut for solos, the second drive circuit is augmented in the mid-range. Bright, easy to see LEDs deliver on-stage switching cues so you know exactly where you are at all times. 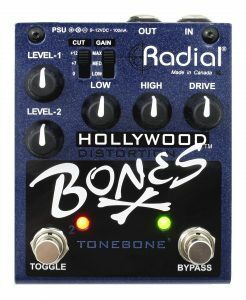 Special attention has also been applied to ensure the Hollywood performs quietly in concert with other pedals. The circuit begins with Radial’s award winning class-A buffering circuit with load correction. This innovative approach retains the essence of ‘true bypass’ performance while lowering the impedance and susceptibility to noise. This enables the Hollywood to efficiently drive the guitar signal when using longer cables. Advanced EIS – Electronic Impulse Switching – eliminates the use of latching footswitches for unmatched durability without the challenges posed by mechanical switches. As most players today employ pedalboards, the Hollywood features standard “Boss” style 9V powering that will adapt to most multi-pedal power supplies. The ultra compact design with top mounted i/o connections allow pedals to be brought close together for those wishing maximum pedalboard density. The Hollywood is a high performance distortion & overdrive pedal that delivers decades of “American” style tones in a compact and easy to use format. Rock and Roll!